SSL/TLS dominated the conference with talks on its use at FB, Google, Amazon and modifications in the direction of TLS 1.3, with presentations on QUIC, OPTLS, S2N and more, covering things like lower latency, forward secrecy, better ciphers. Some of the optimizations can have an impact on data center operations efficiency. The timing attack on S2N protocol was interesting – the KL divergence measures the difference between two probability distributions and can be used to leak information from an SSL stream. Privacy preserving operations on encrypted data (Skyhigh) talk was also interesting. Paul Grubbs discussed searchable symmetric encryption tradeoffs and open questions around a stateless SSE. In case of an encryption proxy, who maintains it ? The client would find it cumbersome. So an encrypted index is maintained by Skyhigh. This is not easy to manage. Also if one wants *both* security and privacy the search times and/or the number of roundtrips goes up. Cryptol is a software from Galois to simulate ciphers and is useful to model, verify and even implement them. It is written in Haskell and is open source. It comes with several examples including the Enigma cipher. I tried this and will blog about it later. I expected some presentations on DNS security – e.g. DNSSEC and DANE; talked to attendees from Verisign on their offerings (ddos monitoring, threat intelligence graph). DNS operates over IP (vs an out-of-band method for updates/insertions); with DNSSEC the DNS server needs to trust the same CA as the origin server which feeds it the DNS record. The general feeling I think is the trust problem has to be solved at the application layer and attacks like the Kaminsky attack have been mitigated against. Here’s a diagram of the QUIC protocol. 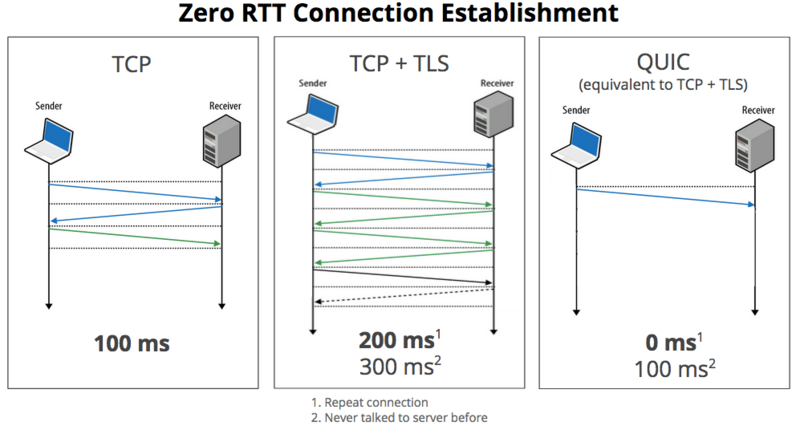 The claim is zero RTT for a repeat (secure) connection to the server (75% of the time), by combining TCP and SSL handshakes into one and caching state on the client. A practical attack on QUIC is discussed in this paper, a type of adaptive chosen ciphertext attack, which references this paper by Zhang, Reiter et al, discussing more general PAAS attacks including an SAML SSO attack.